Shog wants something like this set. I want something like this one. (I also like the drawer option.) Shog and I agree closely as to the style of the bunk beds, but he doesn't think we need the stairs; he might not, but his knees, Barefoot, Zelda, and I do. *snorts* I'm pretty sure I'll get my way on that point. Besides, the stairs-as-storage option is excellent. In other links, check out these mug sweaters and No Dungeons, Just Dragons (I'm easily distracted while I browse). I really like the idea of double bed sized bunks. We used to have one that the bottom had a sofa bed which pulled down to a double with a single on top for the girls, but it wasn't comfortable enough for long term use in the end. Stairs are a wonderful addition, especially with the storage option. The two things I hated when I was a kid sharing bunks with a younger sister was the ladder (rungs hurt my bare feet) and the sprung base on the top bunk which my hair always caught in when I sat up properly. Otherwise, I loved that bunkbed. One thing I'd warn you about; some cats love waiting on the other side of the bars for unsuspecting humans to walk past so they can attack ankles (a friend had a cat that also waited on the main staircase and tried to attack passing heads!). I love those storage stairs! I think I'd prefer it if the drawers opened out on the end as I've seen in some models, but none of those are full over full. The futon pull down version is hideously uncomfortable as I recall; a friend had one in college. But . . . bunk beds! They're so much fun. :D Shog and I'll be able to sleep together up top or below—we'll just need to figure out a way to keep Albus from climbing the stairs. I'm afraid he'll try to jump off the top if we let him up. Bunk beds are so great, and I just adore stairs-as-storage. The ceiling in our flat is far too low to manage this, but I was seriously considering buying a loft bed. It would create so much space! 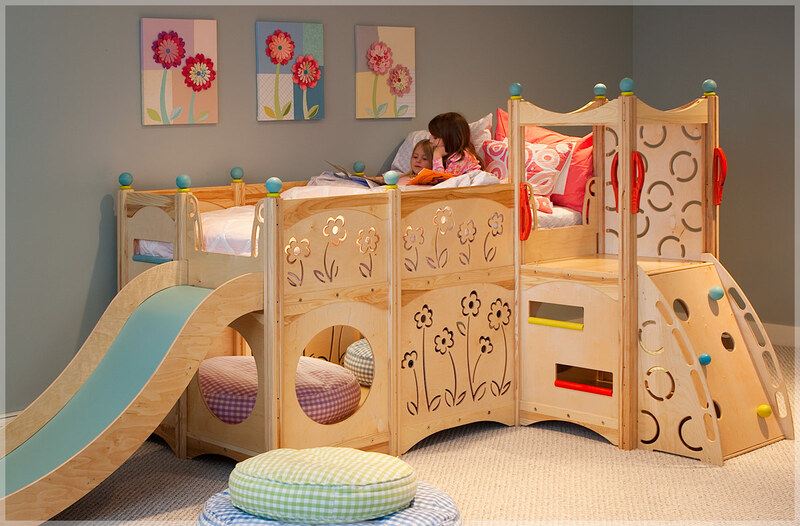 My kids have this bed, but with a second set of drawers instead of the trundle (but still the ladder on the end like in that photo). I'm in love with this one too, especially the colour, but I'm glad I didn't get it because it wouldn't have fit into our flat! I like loft beds (the desk-area-fort-option is always cool), but I love more the ability to sleep up or down, and with Shog (and with enough space)! I adore the idea of loft beds, but being able to have a choice about sleeping up or down is wonderful. Especially right now for me, *wry smile*. The storage is magnificent. We're going to need an extra chest of drawers soon, because A is such a little fashoinista, but up until now they've been able to fit all of their clothes under the bed. That's so convenient, and I love it. Whee, 9' ceilings! That would be so awesome. TED talks are the best. I haven't listened to this one but definitely will put it on my list. Even now, that fancy slide bed with its comfy nook is seriously jealousy inducing. What Patel's doing is amazing; I highly recommend her talk! I can see the appeal of waterbeds, but I think I prefer sleeping on "land." :P Shog and I sleep together, so it will be fun to have the fort option or the look-out option until we move into the new house (and into a king bed, which we've been promising ourselves for ages). P.S. I've sent you a second PM; check your spam folder. ...I want a bunk bed. *beams* With stair-storage, definitely. That is a totally cool, perfect thing. Pillow fort! Pillow fort with crow's nest!